My two pet feeders are working flawlessly for the past 7 months. We care for our pets during the day of course but they now get at regular times their feed. Very happy with the system! 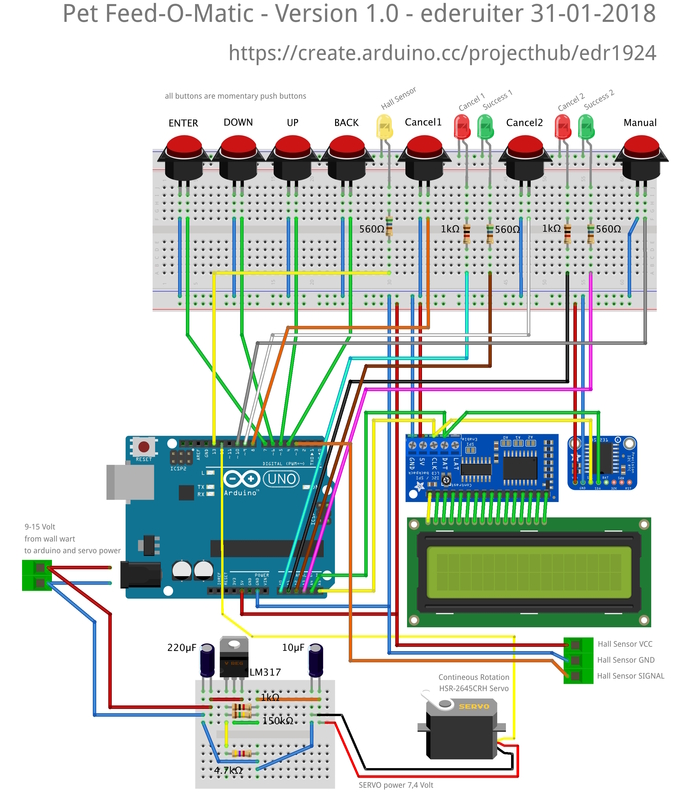 My version of a pet feeder is based on an Arduino microcontroller. The materials used are relatively cheap and I think it's easy to build! You can cancel an upcoming feeding individually for both timers with display and Led indicator. Cancelling is automatically reset after the set time has passed. front panel: special laser printer foil, aluminium look. lots and lots of HOT GLUE. Online you can find many LM317 calculators. The challenge was to make a mount for the feeder and looking around on the internet did not help me much so I looked around in my shed and found some beautiful pieces of Cedar wood. The wood holding the plastic cereal dispenser is 3 cm thick so no wobbling! You need to be sure the hole (my feeder base is 86mm) is tight so measure before drilling! Better to drill a smaller hole and shape it a bit than a hole which is too big. Look at the photo's to get the idea why and how it fits together. It HAS TO BE a continuous rotation model!! Do not attempt to modify a normal servo as I did. It performed not nearly good enough and when stopping, it was not immediate. So now was the question: how to connect the servo to the feeder paddle wheel? It seemed at first the hardest part of the project but it was in fact very simpel. the center hole was later made bigger to 8mm. The blue tape is used to draw the lines. At the outside I drilles 6 holes of 3 mm, the thickness of the magnets. These are used to give the Arduino feedback about the position of the feeder peddle wheel. Because the paddle wheel had 6 rubber paddles I used 6 magnets and divide them around the edge of the polycarbonate disc. 360 degrees divided by 6 is 60 degrees. The rod magnets will fit in snugly. The hall sensor will detect each of the 6 magnets so we can use that information to precisely position and stop the paddle wheel. The servo stop delay time variable is used to add a delay after feeding, before stopping the servo. So with this delay you can tweak the exact position of the paddle wheel. This is important because if the 'stop' position is wrong, the feed will not exit the paddle wheel completely. Also the position of the hall sensor may be different in your case. Tweaking the servo stop delay variable time will solve this. Now we can glue the paddle wheel axis into the polycarbonate disc. Notice the comments under the pictures! 1 / 4 • I used hot glue. Be sure the axis is perpendicular to the disc! The white round servo horn is bolted on the polycarbonate disc with 3 M3 bolts. use some extra nuts as spacers and don't over tighten! Now the servo is part of the feeder assembly so we can put it in the wooden mount and measure how tall the wood piece has to be under the servo. The hall sensor I used is of the UNIPOLAR type. It will give a LOW output if a magnet is near and DOES NOT need the reverse polarity of the magnet to reset the output to HIGH again. So use a Unipolar hall sensor, much easier. !!! The hall sensor needs a 10KΩ pull up resistor. I fitted a 0805 SMD resistor right on top of the hall sensor but you can do it your way. Don't forget this resistor! Then I took an old ballpoint pen and used the plastic as a holder for the sensor. for the external connections I used female precision socket connectors, not the cheap chinese ones. I use these a lot in all my projects. Nothing worse than bad connections causing (hard to find) faillures. On the servo and hall sensor cables I soldered these quality pin headers. After that, I took the laser print of the front panel and only laminated the top with laminating pcv. very nice finish, protecting the front and lifting the colors beautifully. Then again, I glued the laminated paper on the housing with the varnish. My idea was that the varnish would permeate the paper making it water resistant. But because I used thick paper that did not work and making it wet to test water resistance, the paper curled off the housing. --> PARTLY FAIL, to be investigated further. FINALLY... I used the foil print without protection... It will show vinger prints when handled often (look under the BACK button of the photo at the top of this page, housing in the chicken feed) so not ideal but still good enough for me. That's all folks... have fun! I used Arduino IDE 1.8.2. BE CAREFUL NOT TO HAVE TWO VERSIONS OF THE SAME LIBRARIES IN YOUR LIBRARIES FOLDER!! display and Led indicator. Automatically reset after time has passed. // used for the Hall sensor fail backup function. // for tactile button switches. // To keep things simple, we use the Arduino's internal pullup resistor. // turn of the feeder (one portion). // These lines are needed to make this sketch a C++ file. // Disable the default square wave of the SQW pin. //no action, end of menu items!